This is a simple concept and makes one wonder how something like this is not already on the market. It’s dark and you’re lying in bed. Your smartphone is on your bedside table, you realize that you forgot to plug it into its micro USB charger. Do you turn on your bedroom light and zap your eyeballs with sudden light? Or, maybe you fumble around in the dark feeling for your charging cable. Once you get the cable in hand, you have to line up the plug so you don’t break anything. You can always light up your phone and check the orientation of the plug, then use a sense of feel to guide everything in place. Dustin Orndorff has a solution for you, a light-up USB cable. The concept is indeed simple, a small LED embedded in the USB connector that lights up with the push of a button. This is a far more subtle solution compared to some products out there that light up the entire cable like a rave accessory. 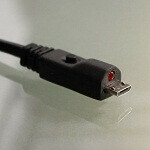 A relatively modest goal of $9,000 has been set up on Kickstarter to get this cable to market. With 25 days to go, they are already about a third of the way there. If this is the light you have been looking for, check out the source link. The “early bird” prices are not expensive and delivery is expected in April 2013. Or just buy a wireless-charging NOKIA Lumia 920 or 820 and simply plonk the phone down on its charging pad or pillow!! That's a solution that's vastly worse than the problem. lmao the Lightening cable doesn't have competition..........................because it's garbage. Yes, because you need a light to plug the Lightning cable in the dark and because it scratches the phone if you don't hit the socket square. Plus, we all want dumb connectors that only transfer or charge. We don't need a smart connector like Lightning that is reversible and will stream to any stereo with a USB port. Anything by Apple is garbage, and I have seen most people (normal people, that is) use a 3.5mm aux cable to play music. Troll on, sir. I read that first one slow.. had me thinking you were going to praise it, but I almost spit frosted flakes on my tablet laughing when I seen the end. Dude, really? It's a USB cable. WTF does Apple have to do with this? so simple yet so unique. Several things. This giant part with the light in it will not work with any phone that has a cover on it. You would have to take the cover off. Why not have this magnetic plug anyway? Why not use induction charging? (wifi, Bluetooth for info) Why are these retarded plugs have only one way to install, should have designed to have contacts so that you could plug in either way. Same issue with larger USB plugs. I can put the plug in my phone in pitch black of night. However, still a good idea. I agree with you. I don't know why you got so many thumbs down. Im happy that people are coming up with better ideas. This however, is not the best solution. What we need is a redesigned micro usb port. Something even better than Apple's lightening port. Nope, wrong path to take cable companies... Apple did something right and that was allowing the device to be used on both sides. There are modified standard USB ports but all the other ports are limited by its shape. This is pretty cool but will it be able to use a 2.1 amp charger? Patent it then License it to a big cable manufacturer and sit back and collect the cash. I feel sad watching this. Though, it's amazing to see people come up with ideas, it seems like the solution is already here and people are trying too hard. I know it's a pain to plug in my micro-usb port to my phone everyday. Most of the times, I get it wrong because I try to plug in without looking....and it's even harder to do this in the dark. BUT, as much as I hate Apple (as a company) and their mostly non-innovative products, I really like their USB lightening cable. It is not an innovation, I know. But it definitely makes it easier for one to plug in the cable correctly in the phone. I am waiting for a micro usb port to come out that is even better than Apple's lightening port. This idea of putting a light however is something I don't like. Maybe a different design would be better. It looks so thick and it will definitely not be compatible with most of the phone cases. WE all know this. Even right now with the current micro usb's, they don't fit in the phone with most cases on. I have had this problem in the past and now carefully choose my cases so usb fits in with the case on. This is even thicker. I usually appreciate enhancements such as these but damn this is so stupid lol. I can easily "feel" the cable to know which side is the shorter one and that's the one that goes up when plugging into the phone—don't need a freakin light for it lol. Yes this is a great idea and unfortunately it is already in the market. I work for a major wireless manufacturer and developed the solution. We currently sell a car and home charger with guide "LED" built into the connector overmold (micro USB cable) to Verizon Wireless. These units launched in December in the US. You can now find this solution in any Verizon Wireless store. The product we make for them features a capacitive touch LED versus mechanical switch. Activated from users touch I was not allowed to add link to this posting but if you check Verizon Wireless corporate site and view chargers you will find this solution currently available During development we originally had a mechanical switch design and changed. I will inform all, between my company and our customer we have filed for patents for each design and we are protected for both capacitive touch and mechanical switch. get up from the bed, turn on the lights, plug in the phone, turn off the lights and go to bed. lazy people.